Heat the oven to 350°F and toast the pistachios for 6 minutes to enhance their flavor. Toast the cumin and coriander seeds in a dry frying pan for 2 minutes, until you can start to smell the flavor being released. Grind in a pestle and mortar or blitz in a food processor. Drain the chickpeas well, and pat dry on a square of kitchen roll. Transfer the chickpeas to a food processor along with the TABASCO® Green Sauce, the ground spice mix, baby spinach, coriander, parsley, frozen peas, chopped spring onions, minced garlic, gram flour, bicarbonate of soda, and the egg. Season to taste with salt and pepper. 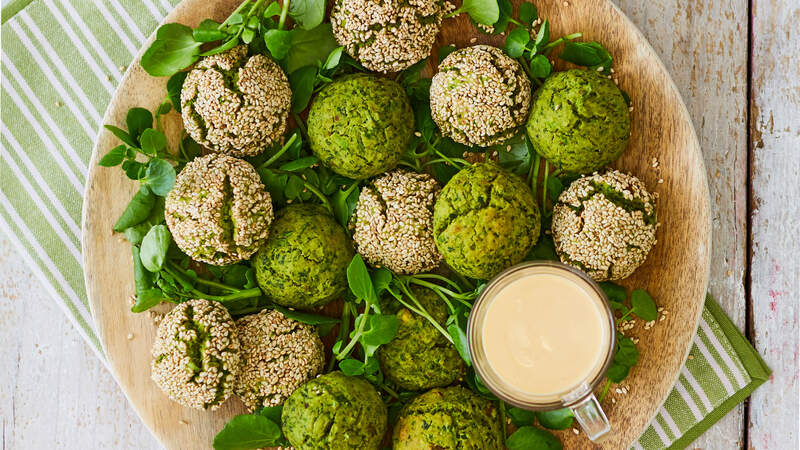 Blend the falafel mix until a paste forms, adding the toasted pistachios right at the end to keep them mostly whole, as this will add texture and crunch to the falafel balls. Transfer the mix to a container and chill in the fridge for an hour. Line a baking tray with some greaseproof paper or baking parchment and roll the falafel mixture into 18-24 even balls. Coat half of the falafel balls in sesame seeds if you wish. Bake in the oven for 12 minutes. When the falafels are ready they can be lifted off the parchment paper easily, and will have a lightly golden base. While they are baking, make the tahini heat dressing by shaking up the TABASCO® Sauce, tahini, milk, cider vinegar and seasoning in a jar. Transfer your falafels to a plate and serve with the dressing on the side. Rolling the balls of falafel with damp hands stops the mix from sticking to your palms. Try the falafels in lettuce wraps with mango, avocado and red onion salsa, or use the tahini heat dressing as a dip for veggies.